Why is South Korea plugging unification? Image caption Park Geun-hye has told South Korea to be "prepared for all situations"
Unification has become something of a buzzword in South Korea this month. President Park Geun-hye emphasised it in her New Year press conference, the opposition Democratic Party did likewise, and journalists, pundits and government officials have followed suit. But with relations on the peninsula as opaque and as tense as ever, many are wondering what has prompted this latest surge in interest. If there is one thing the North Korean leader Kim Jong-un made clear when he executed his uncle, it is that he is no more willing to tolerate challenges to his authority than his father or grandfather. Landmines, watch towers and gun-toting soldiers still line both sides of the demarcation line which separates the two Koreas. And relations between the two neighbours - while currently less chilly than usual - are still far from anything resembling friendship. 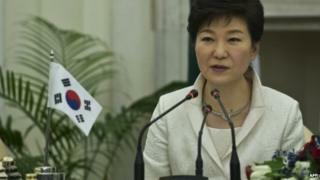 So why has South Korea's president chosen this particular moment to talk about unification? A clue lies in the language she chose in her New Year press conference. Responding to a prepared question, she said that unification would be a "jackpot" for the economy. It was an unusual characterisation. Reunification of Korea, which was divided at the end of World War Two, is official government policy in both the North and the South, though the two governments differ wildly on what a unified Korea would look like. South Korean presidents have often touted its political, social and ethical value, to balance the considerable cost of absorbing the North. In choosing to present it as a positive economic "win" for South Korea, the president was highlighting a growing problem for politicians here: enthusiasm for reunification is waning. In the decades since the division of the peninsula, most of those who remember it as one country have died. In their place, new generations of South Koreans have grown up, in a nation of smartphones, slick advertising and global conferences. North Korea, to many of them, seems like a foreign country. "President Park is trying to turn a negative into a positive," says Bruce Klingner, senior research fellow at the Heritage Foundation and a former Korea specialist at the CIA. "There's declining public support for unification overall, and the weakest level of support is amongst the younger generation. That age-group is fiscally very conservative, and they tend to see the fearful cost - unification having a detrimental effect on their own well-being." A recent survey carried out by the Chosun Ilbo, South Korea's most widely circulated newspaper, suggested that only just over 30% of the nation thought the benefits of reunification would outweigh the cost, and more than two-thirds did not expect it to benefit individual South Koreans directly. "Most people in South Korea aren't ready to think about reuniting with the North yet and I personally don't feel the need to," explained Kim Jung-yoon, an 18-year-old high-school student. "There's talk about combining North Korea's natural resources and the South's technological prowess, but I think that's just idealist thinking. If reunification does occur, it'll just be a burden for the South." Many analysts say that a united Korea would - eventually - create an economic force to be reckoned with. But the initial cost of absorbing the North is estimated to be huge. German unification cost $2 trillion and, as many people point out, East Germany was a lot further up the scale of economic integration than North Korea is currently. So why has Ms Park chosen to polish up unification's image now? "It's not one single reason," one government official told me, "but the accumulated events over the past few months, including the execution of Chang Song-thaek, have had an impact on how we perceive North Korea. Unification might be not that far away, and we need to be prepared." President Park has said publicly that the execution of Chang Song-thaek in December 2013 made the situation on the peninsula more unpredictable. "No one can predict what will happen in North Korea," she said, "and we should be prepared for all situations." One major South Korean newspaper even reported that the country's intelligence chief told his staff "in a year-end pep-talk" that unification could be as soon as next year. Few would be that bold (and even fewer would assert that South Korea is ready for it) but Bruce Klingner of the Heritage Foundation says Ms Park's new rhetoric on unification has sparked wild speculation in the US over whether South Korea has behind-the-scenes intelligence that the Pyongyong regime is more unstable than previously thought. "I think it's more about domestic politics here in Seoul," he said, " it's the third pillar of her 'trustpolitik' policy. First, she emphasises strong defence against North Korean provocations; second, conditional engagement; and third, working towards eventual unification. "Whether that's how North Korea sees it is a different question. I would think they'd see it as an attempt by the South to overthrow or undermine Kim Jong-un: not as a diplomatic initiative, but a hostile take-over." Reunification may once have been the abstract goal both sides could bond over. Nowadays, there's little doubt in many minds that a unified Korea would mean the end of the North Korean regime. Ms Park's description of it as a "jackpot" may not have gone down well in Pyongyang. But then, as Jung Myung-shik, a Seoul taxi driver in his 60s, observed, South Koreans may not be the only ones losing their taste for unification: "The North Korean leader is a young man, he's being treated like a hero across the border, and he can keep that kind of status for many years to come. Why would he be interested in reuniting with the South?"